I have nothing much to say just yet. But the week has passed, and that means that he’s back. I feel like a little girl around Christmas time, overly exited and not grown-up at all. I don’t care what the critics say, I know there will be scenes where I will be glued to the screen indulging every word he says in that voiciliciously Scottish accent. Arrrrrrrre you prepared for what’s next? Now that’s a wallpaper we dig. And there are 9 hours and 25 minutes left before I am off for a wild sailing trip on oceans far beyond imagination. I think you’ve watched the trailer too many times. No – you can’t watch the trailer *too* many times. 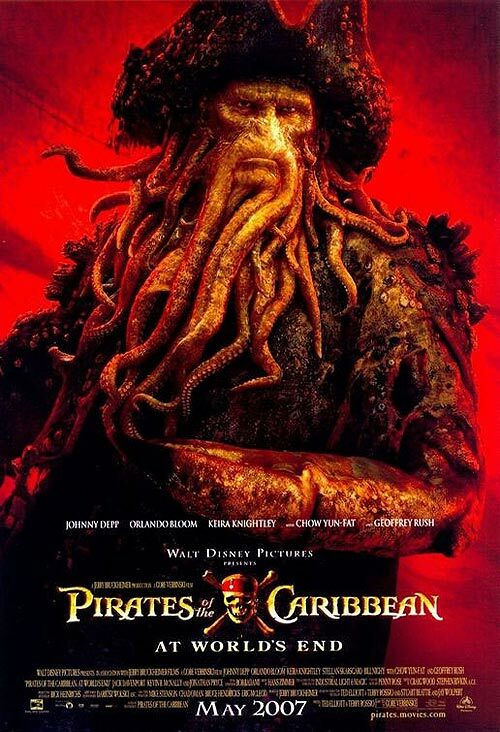 And let’s tentacle it – pretty handsome bloke this Davy Jones. The beauty of Davy must be on the inside…somewhere. And I like my man with moving tentacles growing out of his chin. Nothing wrong with that. And I don’t eat seafood – for obvious reasons. I don’t like the fact that his name isn’t even included with BIG letters on the poster with him on it! So rude. Thank you Anna P. for bringing it up, as I can’t agree with you more. I didn’t write about it because then people will think bla-bla-bla yeah yeah yeah etc, but it is as you say rude, and absolutely unbelievable. I hope the Kraken will put things like that right tonight. Who is Johnny Depp anyway. Or Orlando Bloom for that matter.